Secretary of State Hillary Clinton traveled to the Ivory Coast (Côte d’Ivoire) this week and spoke of hope for the future. Hope was something not often talked about when this African nation was embroiled in violence last year over a disputed election. Humanitarian aid is critical for this country traveling the road to peace. A whole generation of children in the Ivory Coast needs nutrition and education, something many had to go without during the months of fighting and displacement. In January, the UN World Food Programme (WFP) started to provide school feeding to 600,000 children in 3,400 schools around the country. The initiative also provides food for about 25,000 voluntary teachers. The school feeding gives these children a very important meal, which includes rice, of about 700 calories. Providing food at school boosts attendance rates not to mention class performance. So two key areas of Ivory Coast’s recovery are addressed with this program. This free meal is of the utmost importance for so many impoverished families that lost so much during the conflict. Funding, though, is the critical issue going forward. WFP relies on voluntary donations from the international community. Food to reinforce peace depends on keeping the donor pipeline moving. 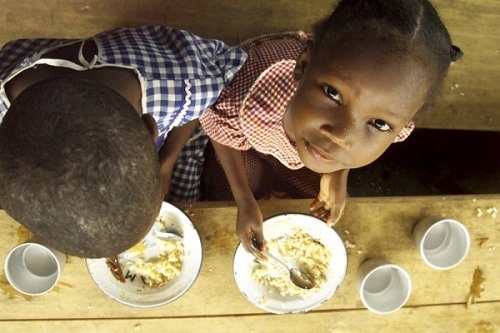 WFP says that the Ivory Coast school feeding program is only 11 percent funded. The program can run for the time being. However, by April supplies will be needed to maintain the school feeding. Donations now are critical because it can take several months for a donation to translate into delivered food. If no action is taken there is the the risk of children facing reduced rations or even losing their school meal come spring. This would impact the recovery process and the health and education of children. School meals are a vital building block for this vision. So it’s important that this program be supported and evolve into a national school feeding program for the Ivory Coast. Such a vision need not be too far off in the future, if the will exists now. Article first published as Building the Future in Ivory Coast with School Meals on Blogcritics.